I have always felt that my inner self was playful, curious, compassionate, fashion-oriented, and, especially during the summertime, colorful; thus, when I was given $50.00 to spend on anything of my choosing at SwayChic, I took Mainbocher’s words to heart, and selected two items I felt reflected my inner self – and would make a strong impression on my summer wardrobe! ♥Knit Cropped Halter in Lavender – During the summertime I live in tops that show off my shoulders, as they keep me completely cool (temperatures are known to hit 107* and higher where I live), and allow for a very subtle, chic form of sexiness. The Knit Cropped Halter had all of this, which is why it was love at first sight. This particular top looks small when you remove it from the packaging, but it fits so well (I am a 34B, 5’1, and got the Small), and has a super pretty ruching along the front, which adds a little extra dimension to the style. Due to the fact that I’m short, I actually wear this top with standard shorts (i.e. not high-waist), and it looks gorgeous, with just a couple of inches of toned tummy showing. Definitely a staple for the warmer months – and adorbs for tossing over a bikini! Also available in Tan. ♥Rectangle Bag in Teal – One of my fashion / accessory obsessions is colorful clutches. I have literally resolved to add a clutch in every color of the rainbow to my collection; so when I saw the Rectangle Bag in Teal I had to have it. I am in love with this bag. In terms of size, and the length of the removable strap, it is incredibly similar to that of the Rebecca Minkoff Morning After Clutch (MAC), but that is where the similarities end. Inside there is two side pockets; and outside there is a push-lock closure which I adore because it’s not something you see every day on a bag. In fact, I usually see it on Mulberry bags. The detachable chain strap matches the push-lock detailing. Both are gold in color, but more of a rose/white gold than a yellow gold, which is really pretty; and, like the push-lock closure itself, very unique. If you follow me on Instagram @cafefashionista, you may have seen me post a picture of this clutch, and how I accessorized it earlier in the week (which you can see below). Also available in Coral. While I focused on tops and bags during my mini shopping spree; SwayChic offers a gorgeous selection of everything from dresses (I’m currently crushing on the 60s Inspired Crepe Shift Dress and Floral Embroidered High Neck Dress), jewelry (the Lydia Bracelet tops my wish list), and shoes (I know I’m not the only one who wants a pair of the Woven Neon Wedges in Pink! ); as well as denim, jackets, and even hair essentials (like patterned turbans!). If you were given the chance to go on a SwayChic Shopping Spree, what would you buy? Thanks to SwayChic for the pictures. I love the bag, its cute...love your sense of style! Sweet style. Must check this place out. I love this pink and teal together. Beautiful jewelry! I love the clutch. It is the most gorgeous shade of teal ever. I wish I had more bright clutches. Definitely, some fun dresses at sway chic. under 30 bucks. Cool! Love the quote. Great site. Lots of beautiful things to find at their store. Love the florals! Love that bag. I am sooo sorry I never emailed you back! Eeek! Life just really got away from me these last few weeks. You know I love you! Oooh good choices! I like your color picks! And that Mainbocher quote is perfection. Happy weekend to you Erika! Love that quote! The bag and ring are super cute. Happy weekend! Oh, I saw that rectangle bag in teal and coral and really loved it in both colors. Glad you got it! So cute! Perfect for twirling! This site looks awesome! I adore their cape back chiffon maxi and the chiffon overlay maxi. Both are ethereal! I love both items. Fabulous selections! oh darling! I bet that style of top looks great on you. and wow that teal bag is SOO cute. I've never heard of this company but I'm liking their style! I'd probably go with the structured colorblock cutout dress. Loving that orange and pink together! Sounds like a great site. That clutch is so perfect. I love the colour. Turquoise and pink! 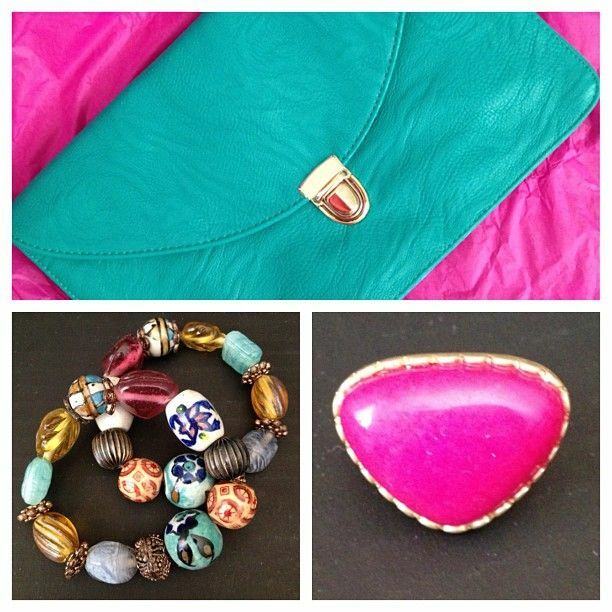 Great colors on great accessories! Must add to my clutch portfolio! Love these choices! I would probably buy everything haha. The clothes are so colorful and cute!